According to the National Board of Chiropractic Examiners, 2.7 million visits are made each year to chiropractors in the U. S. for scoliosis and scoliosis-related complaints. 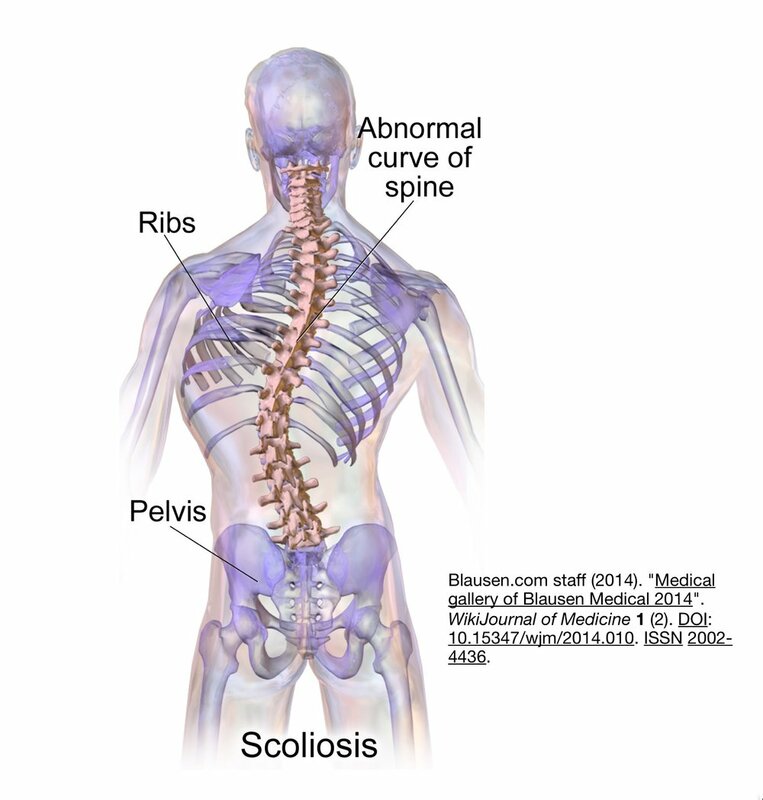 Scoliosis is described as a sideways S- or C-shaped curve of the spine. Left untreated, scoliosis may cause other health problems like headaches, back pain and radiation of pain into the arms and legs, breathing problems, and digestive disorders. Scoliosis is most common in late childhood and the early teens when children grow fast. It occurs more often in girls than boys. Scoliosis causes one to lean to one side leading to uneven shoulders and hips. Sometimes but not always it is somewhat easy to notice. This is because the body tries to align the shoulders no matter the curve so the eyes are properly aligned with the horizon. Scoliosis may affect patients of all ages, even those as young as 20s and 30s. Whether you've developed the condition in childhood or as an adult, the aging process can cause or intensify symptoms of scoliosis or a related condition. Scoliosis is considered mild if the child's curve or Cobb angle(1) is under 25 degrees. Over 25 degrees, we advise our patients to be under the observation of an orthopedic doctor while we perform CLEAR treatment which is well described below. Neuromuscular scoliosis (5% to 7% of cases). This type of scoliosis is caused by a neurological disorder of the central nervous system or muscles. Congenital scoliosis (10% of cases) is due to bony abnormalities of the spine present at birth like wedge vertebra. Small curves usually do not cause other health and quality of life problems but more prominent curves pose potential health concerns. Severe curves can interfere with lungs and vital organs. Lung and breathing function may be affected and may often be accompanied by pain and spinal dysfunction. Treatment depends on age, how much more the patient is likely to grow, the degree of curvature, and whether the curve is found to be temporary or permanent. Those with mild scoliosis might only need checkups to observe any progression of the curve. Others might need to wear a brace designed for scoliosis treatment and in some cases, some physicians may suggest surgery, however a novel and effective chiropractic protocol for the evaluation, assessment, and treatment of scoliosis developed by the non-profit CLEAR (Chiropractic Leadership, Educational Advancement, and Research) Scoliosis Institute should be explored before opting for invasive spinal fusion surgery. “ Motion is essential for healthy spinal discs. Hypertonic(4) muscles impede spinal flexibility, and hypotonic(5) muscles reduce spinal stability. Ligamentous abnormalities contribute to proprioceptive feedback mechanisms and sensory dysfunction. Posture, proprioception, balance, and equilibrium are involuntary mechanisms, regulated by the cerebellum(6) and automatic postural control centers. The protocol is created to enhance motion in restricted areas of the spine, influence spinal alignment and retrain the motor sensory feedback loops involved with posture, balance and proprioception(7). The Standard Care Treatment Plan will involve regular visits to Wagner Chiropractic, usually around two to three times per week for 18 treatments. Each visit has many stations and lasts approximately two hours. Ongoing monitoring and follow-up care is provided according to the patient’s individual need. A home CLEAR scoliosis exercise program must be followed daily or several times weekly as well. “The CLEAR Approach.” CLEAR Scoliosis Institute, www.clear-institute.org/about/the-clear-approach/. The first phase is designed to prepare the body for treatment. It includes warm-up exercises, massage, and other therapies designed to relax the muscles and the spine. The second phase involves specialized chiropractic adjustments that do not involve the chiropractor using his hands to rotate or “twist” the patient’s head. Rather, advanced mechanical adjusting instruments are used to provide gentle, precise correction. Adjustments are also performed on the back, hips, and other areas. The third phase consists of specialized exercises that influence posture, balance, and coordination. They activate specific muscle groups along the spine, as well as specific areas of the brain, to change how the brain and the body work together to achieve a balanced, more natural position. Dr. Ramah Wagner, D. C., B. S., F. I. A. M. A., D. C. R. C., is one of less than 45 physicians worldwide who are certified by CLEAR Scoliosis Institute to offer these treatments. Stop in and see our CLEAR scoliosis center within Wagner Chiropractic–A Center for Healing in Eustis, Florida.